Canon EF 24-105mm f/4 L IS USM lens : Canon today announces the launch of its latest professional L-series lens: the lightweight Canon EF 24-105mm f/4L IS USM lens with Image Stabilizer. Dust and moisture resistant and incorporating Canon's very finest standards of precision optics, the Canon EF 24-105mm IS USM is designed for reportage, event, travel and celebrity photographers looking for a lightweight and maneuverable lens with minimal image quality compromise. Complementing the Canon EF 17-40mm f/4L USM and Canon EF 70-200mm f/4L USM, the lens completes Canon's f/4L-series zoom lens range. These lenses are designed for professional photographers requiring a light zoom lens with a fixed aperture throughout the zoom range. For outstanding camera shake reduction, Image Stabilizer allows shutter speeds of 3 stops slower than would otherwise be possible, with no perceptible increase in image blur. The L-series is Canon's flagship professional lens range, designed to include outstanding image performance, ultimate operability and weather resistance. The Canon EF 24-105mm f/4L IS USM digital camera lens offers a lightweight alternative to the renowned Canon EF 24-70mm f/2.8L USM. 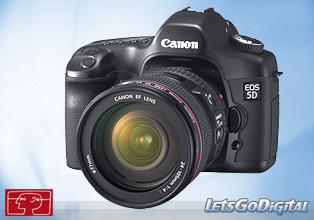 Canon D-SLR lens - Image Stabilizer : Image Stabilizer (IS) dramatically reduces image blur caused by camera shake. Gyro sensors detect unwanted vibrations, triggering the corresponding movement of a correcting lens group perpendicular to the optical axis. This alters the light path, returning the image to its correct position on the sensor or film plane. The 3 stop advantage means that photographers normally shooting a 105mm lens handheld at 1/125 sec can obtain a shake free result with a shutter speed as low as 1/15 sec, for vastly extended options in low light conditions. Canon EF 24 - 105mm IS USM - Superb auto-focus : The ring-type USM motor found in the EF 24-105mm f/4L IS USM employs ultra-sonic frequency vibrations to drive auto focus with unrivalled speed and near-silent operation. A powerful CPU and improved AF algorithm contribute to speed performance. Good holding torque stops the lens with precision and accuracy, the instant it arrives at the correct focus point and without overshoot. Photographers can choose manual focus instantly and at any time simply by moving the manual focus ring without first having to switch out of auto focus mode. Canon IS USM lens - Constant f/4 aperture from 24 to 105mm : The EF 24-105mm f/4L IS USM offers the highest possible optical quality with no change in aperture over the full focal range of the lens. This allows photographers to set exposure at the widest aperture and zoom all the way through to 105mm without having to vary the shutter speed. It is the perfect lens for professional photographers looking for a lightweight and extended zoom alternative to its EF 24-70mm f/2.8L USM counterpart. The lens employs an almost perfectly circular barrel aperture, helping create attractive, defocused backgrounds. Canon f/4L IS USM lens - Image quality : To limit lens size and improve image clarity over the total image area, an Ultra-Low Dispersion glass (UD) element is used to eliminate the secondary chromatic aberrations that otherwise reduce sharpness and introduce colour fringing. Aspherical lens elements correct spherical aberration for crisp, high contrast corner-to-corner quality. 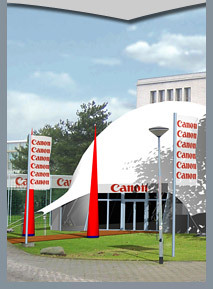 By optimising Super Spectra lens coatings and lens element shaping, Canon's engineers have been effective in suppressing flare and ghosting, more prone to occur with digital cameras due to reflection off the image sensor. 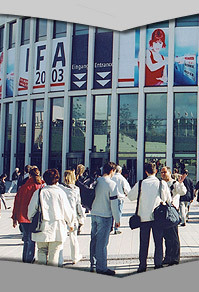 By increasing light absorption, coatings reduce reflections off lens element surfaces to deliver crisp, undistorted images with natural colour balance. Canon EOS system integration : The Canon EF 24-105mm f/4L IS USM includes distance metering information, providing compatibility with the E-TTL II flash system of late model cameras such as the EOS-1D Mark II N and EOS 5D . When used in conjunction with Canon's range of EX Speedlite flash units, the lens passes distance information to the flash algorithm for markedly improved flash exposure metering. To match the weather resistance afforded by EOS-1 professional camera bodies, an O-ring seals the lens against the lens mount and numerous seals around the lens' moving components provide protection against the ingress of dust and moisture. Canon EOS EF D-SLR lens - AF and Accessories : AF Mode and IS switches have been reshaped, making them less susceptible to being engaged or disengaged accidentally. 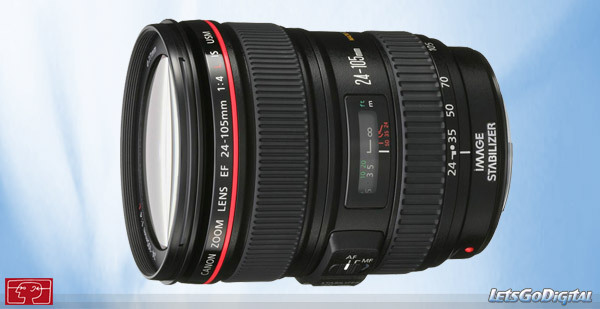 The Canon EF 24-105mm f/4L IS USM comes with a bayonet mount lens hood EW-83H and soft lens pouch Canon LP1219. In keeping with Canon's Kyosei philosophy of living in harmony with the environment, the lens features only lead-free glass.